Tivaci will chase Group One targets this autumn, but beforehand trainer Mike Moroney would like to see him collect a shorter sprint race. The four-year-old resumes in the Listed Kensington Stakes at Flemington on Saturday, with Moroney saying victory would look good on his record. Tivaci is already a Group Three winner at 1400 and 1600 metres, and next month Moroney is planning an assault on the Gr. 1 CF Orr Stakes and Futurity Stakes, both over 1400 metres and at Caulfield. 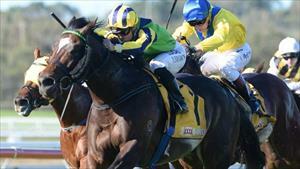 "If we could add a 1000-metre race to his CV, being a stallion, it would help," Moroney said. "He's quite a fast High Chaparral and he's got quite a good record at 1200 metres, so we think down the straight at Flemington he can be competitive at the 1000 metres." Tivaci has two wins and a second over 1200 metres first-up and has been placed at his only start down the straight at Flemington. Moroney has kept Tivaci fresh for Saturday's first-up assignment, his first run since finishing 11th to Awesome Rock in the Emirates Stakes (2000m) at Flemington in November. Tivaci has had just one Flemington jumpout in the lead-up to Saturday's return whereas in previous first-up assaults he has had two trials ahead of starts over 1200 metres. "He had a pretty quick break being a stallion as I don't like giving him too long out," Moroney said. "He had three or four weeks in the paddock and he's come to hand pretty quick. We thought we'd kick him off there and then head to those 1400-metre races." Moroney said there were a number of suitable races available for Tivaci following the Futurity Stakes with the Flemington trainer not ruling out a start in the Newmarket Handicap in March. "There's a lot of options for him but we'll keep him to the mile and under," Moroney said. Patrick Moloney, who rode the four-year-old in his five starts during the spring, will take the ride on Saturday.